Illuminations to move your life forward with ease. ...all of which are intended to propel you forward! Lights On! Claire Knowles spent a lifetime studying people and developing a keen, intuitive sensitivity about relational dynamics. These insights opened up personal pathways leading to an effective professional career in Human Resource Management, and extensive continuous improvement and change management work with women-run businesses, organizations and leadership consulting endeavors. Call 716-622-7753 for a free 30-minute conversation about your Organization or Group and we’ll send this great book to you Free of Charge! Sample the Book: Click here to get instant access to a sample chapter....Free Peak Inside! “With a gentle touch, Claire Knowles allows life to teach her, and by extension all of us. Would that we all could adopt the ways she learns the lessons of life, from everything that occurs around her. As women, we can, and we deserve to, pay attention to her accessible wisdom, and accept her invitation to "turn our own lights on!" Author, "Why Not Do What You Love?" Author, "Musing Along the Way"
“Storytelling is an ancient tradition that helps us make sense of complex situations in our lives. Like Aesop's Fables, Jataka's Tales, or the Panchatantra, Claire Knowles' delightful and insightful tales help us to reflect on our and others' perspectives of life, and how those perspectives impact what we do in life and our relationships with others. 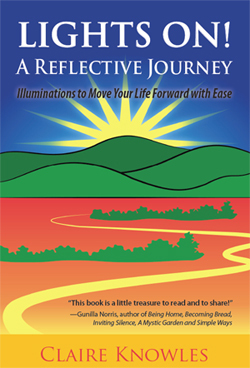 Her tales illustrate how our perspectives impact our quality of life, as well. Sometimes it is difficult in today's complex ,ever-changing world to recognize the dynamics in which you find yourself. Claire's wonderful 'Lights On!' series helps one to reflect and see the dynamics at play, helping us to not only be better leaders, but better people through the process." “There is something remarkably comforting in the way Claire weaves her personal experiences and beliefs into simple but profound lessons for the rest of us to take away. Perhaps its her word choice, experience crafting stories or innate wisdom. Whatever it is, her spirit spoke to me as I read one insightful gem after another. What a wonderful gift she's given us!